White colored infant one piece from the house of ultra force. Made from 100% cotton. It has a Rothco neck label. This one piece is unisex in its design and can be worn by both girls and the boys. It comes with metal buttons that are brass-zinc plated. 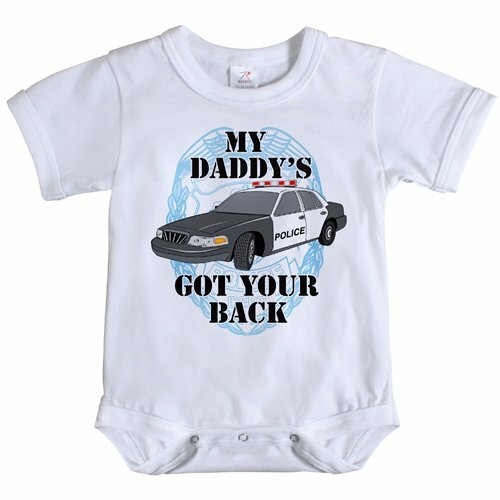 It is a very stylish wear with the words ‘My Daddy’s Got Your Back’ and a police car printed on it. The one piece is white in color making it look elegant in style. The wear comes with a ‘Baby Basic Issue’ hang tag with it. The material, the print, the look and feel of this white one piece is attractive and cute.